It's not just Alexa. Amazon has launched a growing array of private label branded products, and it's probably not much of a surprise to learn that most of these products sell pretty well on Amazon. So what can your brand team learn from the success of Amazon's private label brands?The ecommerce giant invests not only getting manufacturing up to speed so it can meet demand, but also puts in a lot of work around product content and promotions to juice sales on the retail site. In fact, we at Salsify view Amazon private label pages as windows into what product content tends to work well for a particular category. That list of categories has grown significantly, as Cooper Smith at L2 analyzed within an April 3 blog post. 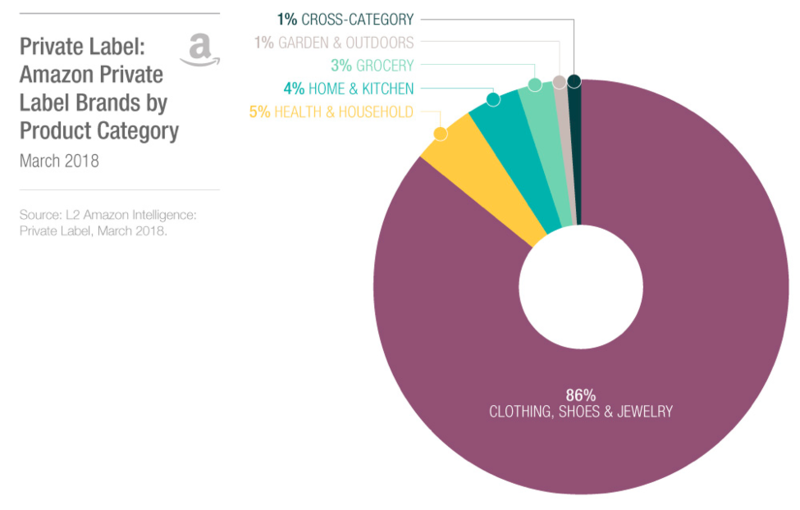 Perhaps most striking – the sheer number of private label brands and products Amazon has within the clothing, shoes, and jewelry categories. 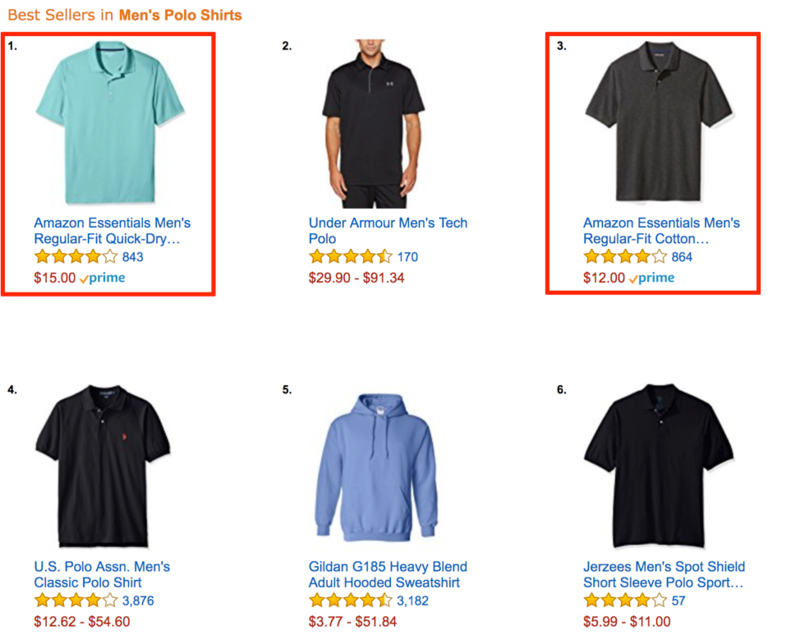 Yet it's clear from examples like the Polo shirt screenshot above, that Amazon is successfully upending more entrenched competitors in these verticals. Amazon is extensively using AMS and other promotional products to place its products at or near the top of popular search results in a given category. Like the content piece, this is another approach we typically suggest brands emulate when launching a new, or previously unknown products on Amazon. First, find the top terms associated with that product category, next, narrow your choices for promotion to those terms which have a good combination of being both popular and still relatively cost effective. The best defensive strategy for national brands against private label trends is to “out-brand” them across marketing channels where retailers have less experience. Traditional media, such as TV, still proves to be an effective marketing tactic for more established brands looking to drive digital commerce sales. You'll hear no argument here that large established brands need to out-brand competitors in order to win – again, that's where effective and robust product content come in – and TV ads do remain effective. But Amazon, and other companies like Bai Brands, San Francisco Bay Coffee, and many others, have proven that brands which commit real resources to winning the scrappy, day-to-day tactical battle on Amazon stand to meaningfully impact sales in a lasting way, and do so without the multi-million dollar price tag, and admitted waste, of a national TV ad campaign. L2 supports its position with an example of Garnier seeing the performance of its facial skin care product on Amazon improve in the wake of a TV ad campaign. 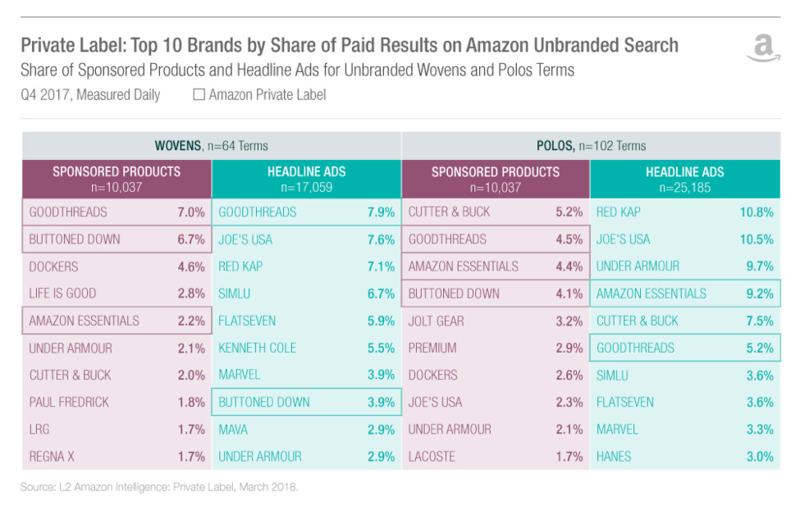 No doubt Garnier helped its Amazon sales with the ad campaign, but it's important for brands to ask hard questions about what promotional options are worth the investment, and really lead to long-term success online. The week I am writing this, the number one, best-selling product under facial skin care products on Amazon is from TruSkin, an independent company. The number two is from Aztec Secret, another independent company. They're beating out well-known products from every large CPG beauty brand – and without national TV ad campaigns. The lesson Amazon should be teaching you with the success of its white label products, is that there is incredible value to be had by continually investing in improving product detail pages and applicable promotional options from the site. Whether you're a multinational brand or a smaller independent one, this thought process – rather than one centered on mass market advertising – should be top of mind when looking to drive sales on Amazon for both new and established products.